With the season’s changing, the staff at WenatcheeOutdoors.org have noticed we have been doing more trail running lately than other activities. This is due in part to the wet weather we have been having here and the shoulder season. It is too wet to mountain bike, but just dry enough in the foothills to trail run. So although this article has been seen by some in the past, we feel it is relevant for the current conditions in our beautiful area! We excerpted this trail running story from Trail Runner Magazine, which focuses on trail running, of course. Written by editors at the magazine it’s a fun read and nicely captures a bit of the appeal of running on trails rather than roads. There’s more about getting going in the links at the end of the story. In college I (Elinor) was a devout road runner, pounding out all my weekly mileage on paved pathways and a rubber-coated oval. But by the time I graduated, the years of competing in track and cross country had left me with IT bands as tight as piano strings and a bad case of mental burnout. I figured my running days were over. Then one rainy day, a former teammate, Larissa, persuaded me to join her for a run at Mount Doug Park, a 700-foot-high knob of rock and dirt in the heart of Victoria, BritishColumbia, on the southern tip of Vancouver Island. I didn’t know about “trail running,” but I discovered something new on the mount’s serpentine trails, as I splashed through muddy puddles, leapt off small boulders and skidded down abrupt drops. Only when we popped out onto the roadway packed with whizzing cars did I realize how fast an hour had flown by. That day I discovered the pure, unadulterated joy of running though the forest. And all it required was a little adventurous spirit and a trail. Almost any experienced runner will attest that running makes them feel euphoric-the runner’s high-though until recently, there was a lack of supporting scientific proof. Then in a study published in the journal Cerebral Cortex in 2008, Dr. Henning Boecker of the University of Bonn, Germany, compared the endorphin levels of 10 endurance athletes before and after a two-hour run. Unsurprisingly, the athletes all had higher levels of mood-elevating brain endorphins post run, and reported feeling happier and more relaxed. However, during a road run, inhaling gas fumes, dodging traffic and pedestrians while avoiding dogs on long leashes and hurdling groin-high fire hydrants can cause tension that may block the rush of happy hormones. Running trails, on the other hand, takes you into a calm-inducing natural environment. In fact, studies on children with attention-deficit-hyperactivity disorder (ADHD)-a mental disorder that causes impulsiveness and an inability to focus-have shown that after walking just 20 minutes in a city park prior to taking a classroom test, they demonstrated better focus and scored higher than when they walked 20 minutes in a downtown or suburban setting. 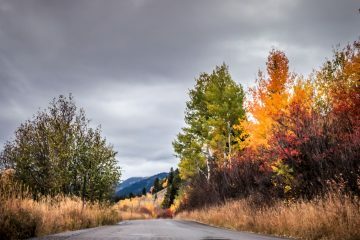 These results suggest that time spent in nature (especially when combined with aerobic activity) has a powerful effect on your sense of well being and mental clarity. In fact, the mental engagement of navigating winding trails, adjusting your cadence over undulating grades, reading the landscape for your next foot placement and hearing only your rhythmic inhalations and exhalations has the power to clear your mind of external thoughts and worries. And regarding injury, the slightly higher chance you have of tripping and falling on a trail is more than compensated for by your reduced likelihood of developing a running-related overuse injury. On a road’s firm, flat surface, each footstrike is identical, whereas on a trail that contact always differs, requiring engagement of stabilizing muscles in your hips and core for balance. This variety, along with a trail’s softer, more forgiving surface, means less strain and fatigue that can lead to common injuries such as shin splints and knee pain. 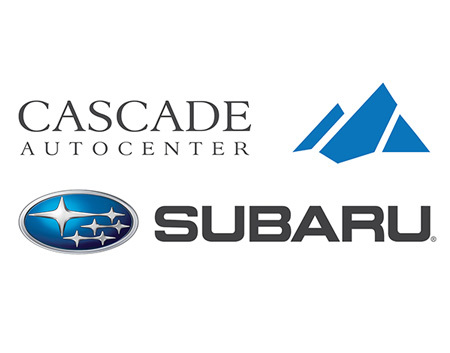 Central Washington is a fabulous place to take up this endeavor. 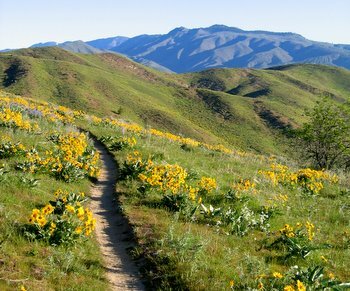 Our foothills have all manners of nearby trails that make trail running easy to incorporate into your life. Notice that we don’t claim that trail running is easy to do. In truth most of our trails have a fair pitch to them and they’re gonna give you hummingbird heart if you don’t listen to your heart. Identify what your target heart rate is and then, if a particular trail is throwing you over that threshold, dial back and alternate between running and fast walking to keep your heart from exploding. Where to Run: To acquaint yourself with nearby or new places to run, use both our on-line hiking guidebook and on-line trail running guidebook. 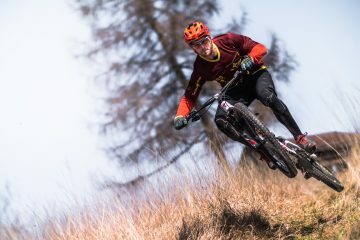 Groups and Training. 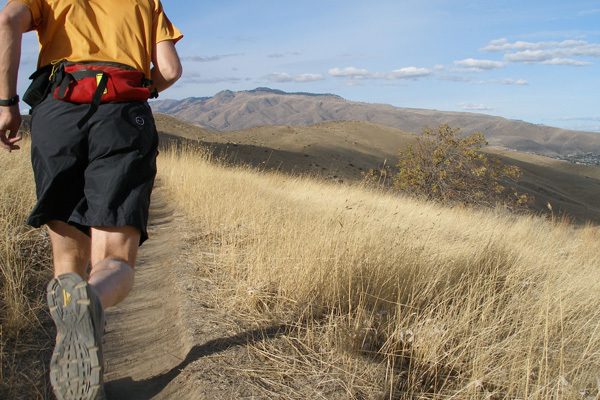 Connect to other trail runners through the local trail running group, Run Wenatchee. 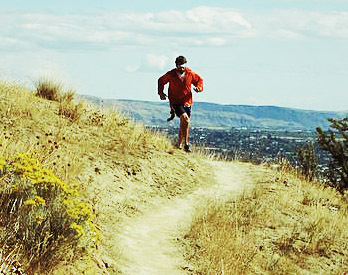 Adam Vognild, co-owner of Inner Circle Gym, is an avid trail runner and helps people train appropriately for the sport. 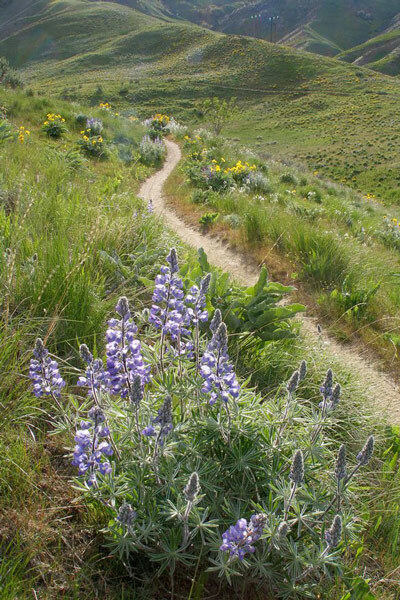 Note: In the Lower Wenatchee Valley, the trails in the Sage Hills and on Horse Lake Reserve are closed until April 1. Around Wenatchee trails on Saddle Rock and Dry Gulch (see guidebooks) are open but this time of year it’s important to be sensitive of trail conditions: If you’re leaving footprints deeper than 1/4 inch or you’re slipping and sliding on a trail’s surface (because it’s soft and muddy) that trail is still too soft and you’re actually causing damage that will accelerate erosion issues and that will require more trail maintenance. Please stay off soft or muddy trails until warmer, drier weather firms them up.